What is the inspiration behind your derby name? It’s based on my surname but a little tougher. What is the inspiration behind your number? It’s my childhood house number. What was your proudest roller derby moment? Winning the best jammer award for the A team and hosting the first ever All Ireland Tournament. How did you first discover roller derby / what convinced you to join? I saw the film ‘Whip It’ and commented on social media that I would love to try it, a friend told me about Belfast Roller Derby and the rest, as they say, is history. What was your best Fresh Meat moment? 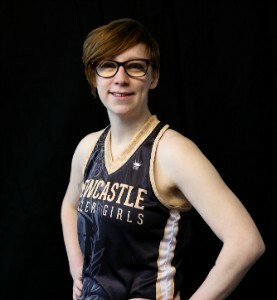 There was no fresh meat when I started at Belfast Roller Derby but it would be when I got my 25 in 5 (back in the day). What other sports / training do you do when you’re not on eight wheels? 5-a-side football, clubercise and the gym.